My packaging shows a slightly more explosive recipe than the one listed below. Last year at this time I got into a bit of a kerfuffle with the local Pole Circle Police regarding the legality of foraging elderflower in the park. Turns out these ill-informed armed guards were under the impression that foraging was illegal. It was a typical win the battle, lose the war moment and facing imminent arrest and not much in the mood to lose the war that day, I did something very unusual for me in a threatening authority situation. 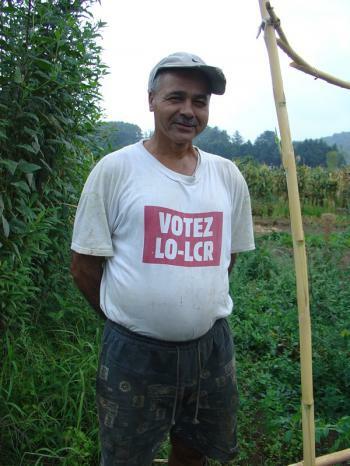 I shut the hell up and let the gendarmes finish their harassment shtick. In order to further boost my burgeoning sense of moral superiority on this foraging issue in all future kerfuffles, I’ve started a personal elder-planting campaign; in the DemoGarden, in the park itself and nurturing little elders in nature. This year I harvested enough of the powdery perfumey flowers from my own sources (and the neighbour’s) to make 20 liters of syrup! And they’re all still blooming away. 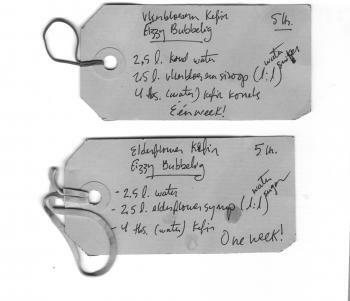 My signature drink to make from elderflower syrup is a fermented, floral, lightly bubbled kefir. 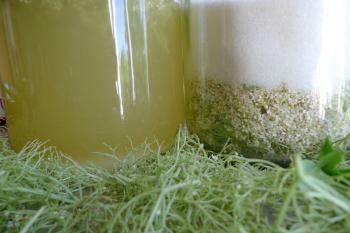 To make 1 liter of Elderfower Kefir mix the syrup 1:4 with water and add a few spoons of your water kefir crystals. Let the bottle sit on a sunny windowsill for 3-5 days. Taste, and when it’s a little sweeter than you would normally drink it, put strain out the kefir crystals (the culture remains), bottle the liquid and keep in the fridge a few days. Placing the bottles in the fridge for a week or so really gets the carbonation going without the drink becoming sour or yeasty. It also prevents the bottles from exploding. 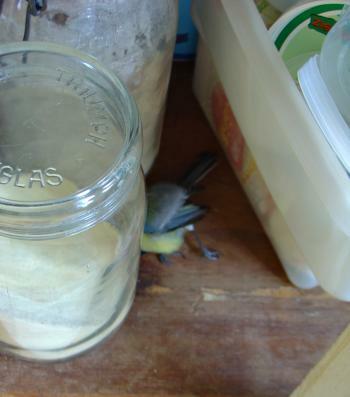 I have taken to using the Dutch milk bottles with screw tops. They leak - which is great, because they don’t explode. The kefir crystals, like all SCOBY’s, are a community of beasts. I’ve found that fermenting at changing temperatures makes for a tastier drink with a nicely textured bubble. 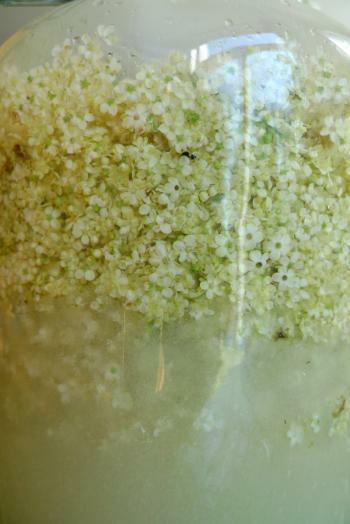 The shift from room temperature to the fridge is all the (elderflower) kefir needs. Find flowers, fruits and greens in Dutch UnFortch! 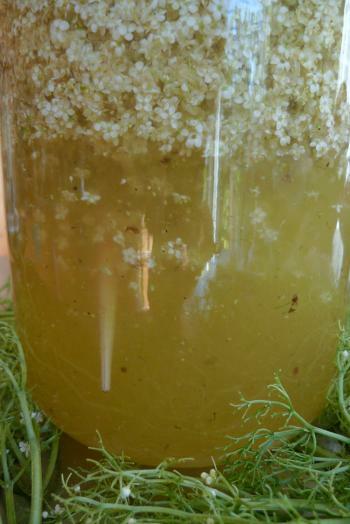 Fill a 5 liter jar � - 2/3 -full with elder flowers. Absolutely unwashed, bugs and all. Remove snails and birdshit, if applicable. The minimal ratio is 1 kilo sugar : 1 liter water. If possible, add more sugar. Pour the sugar, and then the water. After 5 days, start tasting the syrup. It should taste clearly of elder flower. The entire kitchen should smell of elder flower and when you leave the kitchen you can still conjure the smell of elder flowers in your head. If the flavour is too weak, let it sit a few more days. 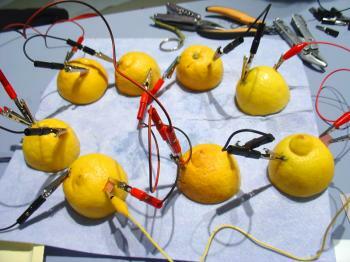 Depending on the weather and kitchen conditions it may even ferment slightly, that is to say become lemony without the addition of lemon juice. This is ok, if not desirable. When you’re ready to call it ready, wring the syrup out of the flowers and discard them. Decant the syrup through a series of fine sieves and cloths to filter out Vitamine Beast. Don�t worry if a bit of Vitamine Beast remains because� it will simply remain. It is vitamine B12, a cause for celebration. Store bottled syrup in a cool and dark place, or refrigerate. 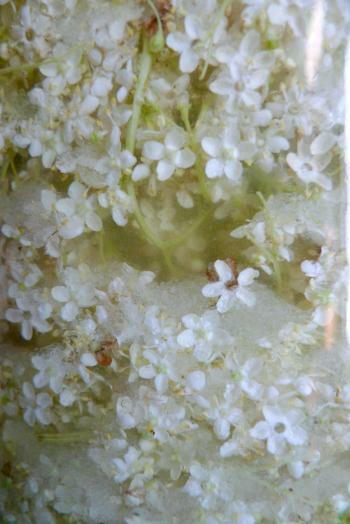 Elder flower syrup is a seasonal product. Enjoy the yearly ritual of harvesting these flowers and getting completely dusted with pollen because it is a supreme joy. The syrup should be used generously and given away freely as a floral sweetener when it is in season (in NL, May � June). Even when refrigerated, it does not preserve well for more than a month or two, and preservatives like ascorbic acid change the flavour considerably. Though elder flower syrup can be reboiled with even more sugar to preserve it for a longer period, beware! You are treading on dangerous territory. Instead, why not avoid all preservation issues by simply using this flowery syrup in season and by giving it away to people you like or whom you want to like you. Remember, the sugar is the preservative that keeps this mixture from transforming. If you don�t like sweet things, dilute the finished syrup in the foods to which you add it. 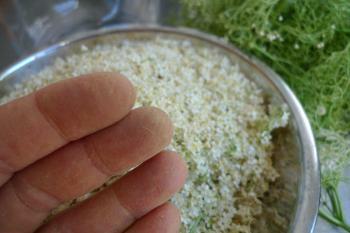 If you are using elder flower syrup as a sweetener in a ferment (e.g. elder flower kefir) just let it ferment a little longer so that the beasts can eat up the sugar. The sugar is not for you, it is for preservation process. 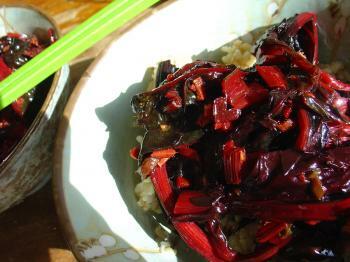 In general use elder flower syrup diluted at a ratio of 1:4 with water, or to taste. On love of bacteria and yeast. 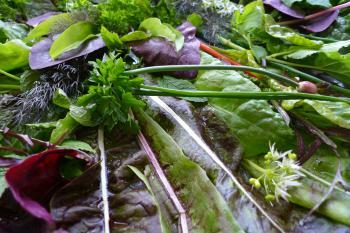 The lettuces in the DemoGarden haven’t even come up, yet this is the sort of salad that we’ve been eating for the past 3 weeks. 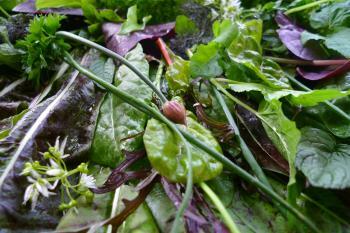 All 18 of these vegetables grow spontaneously in our permaculture garden, most of them sown more than 3 years ago. 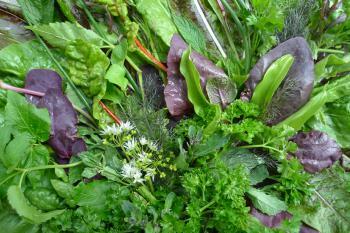 This bouquet-eating abundance is a testament to why we need to transform our cities into resplendent edible landscapes. 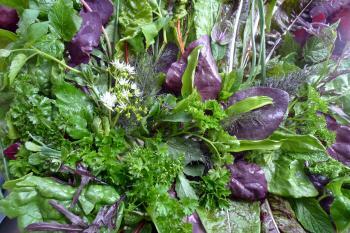 Ingredients: spinach, red orach, chard, smokey fennel, ramps leaves, ramps flowers, chives, chive buds/flowers, mystery speckled red lettuce, purple frills mustard, yellow mustard, raspberry leaf (plucked by accident, tastes wonderful), broccoli shoots, mint, ground elder, sorrel. Not pictured, garlic mustard (alliaria petiolata). 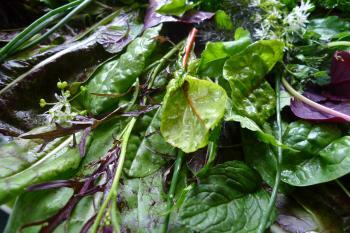 We’re dipping these amazing leaves into our own lapsang souchong kombucha vinaigrette, also fermented from wild yeasts. 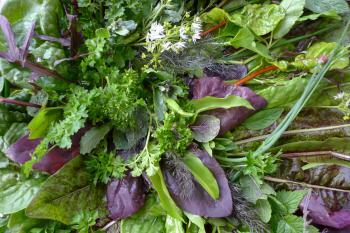 Edible bouquets, we walk, we pluck. We talk about how lucky we are.